Project members are users who have access to some or all of the project's files. 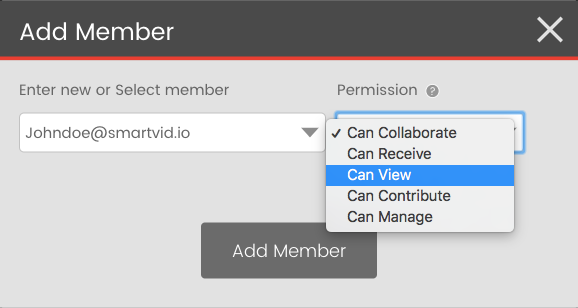 Members are either manually added to a project, automatically added when project files are shared with them, or automatically added if they are a User or Admin in the project's home organization. Each member is assigned a role. Below are the different member roles and the permissions they grant. Note that member roles only exist within the scope of a project; the same person can have different member roles across different projects. In the Enter new or Select member field, type the email of the person you want to add. As you type, matches to existing users' emails will appear as suggestions. Click on an email match to select it. You can also click the right hand arrow to view a list of existing users to choose from. Click the Add Member button to save. Click the Update Member button to save. 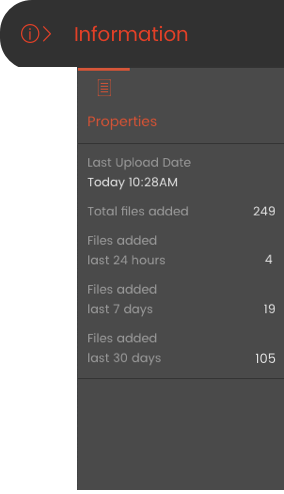 Members with a high enough role can can receive email alerts whenever files are uploaded to the project. This is useful for team members who need to stay on top of new content. Notification emails are sent approximately once an hour. If checkbox is already selected, click it to turn alert emails off. Click the Update Member button to save changes. Turn this on to add timestamped dates to the member's downloaded photos & snapshots. The timestamp will be the date the source photo or video was originally captured. If the checkbox is already selected, click it again to disable timestamps. Select member(s) to delete using thumbnail checkboxes. Click Remove again on the pop-up warning confirmation to permanently delete.